Potential buyer but which model? So far i've not as much as sat in one but have been scanning various for sale sites to get a better idea as to which model, engine size etc., to buy? Here's what i've sort of worked out for myself but any comments advice would be welcomed. First, I have little or no experience of driving anything meatier than an XR3i , and run around in a works van or the family wheels, a Renault Scenic The Z3 will fill a void being used for weekends and a short run commute a couple of times a week. So i'm looking at a 2.8 as a preferred choice having read that anything else is underpowered? 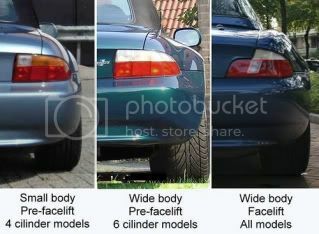 I keep reading 'facelift model' which in some cases is also described as wide bodied. Are all 2.8's wide bodied? What else did the facelift include? My budget of around £4-6k would appear to buy me a lowish mileage 97,98,99 car but were there any changes that should make me think of the latter model or even something on a later plate, funds permitting? In some of the photos i've seen, Red Z3's look a bit pink and washed out. Is/was this a problem with this colour? Any other pointers re seats, accessories, must haves etc., would be appreciated. Given your reasons for buying and use I think a 2.8 is a good choice. Facelift really is a mtter of personal choice, lots of owners prefer the pre facelift style. All 2.8 were widebodied but the facelift altered the "shape" of the rear wings on all non ///M models. This pic shows it well. You can see that the facelift cars have a "hump" on the rear arch. The 2.8's are available in facelift but the engine was replaced with the 3 litre shortly after so most 2.8's are pre facelift (ie made before 04/99). Re the Red, most cameras have auto colour correction and this does affect red in particular and so most pics do not do the colour justice. Note the "red" on the non ///M's is "brighter". Red is one of those colours that can "suffer" from oxidisation (ie its more obvious) which makes it look a little "wishy washy" but this can useually be easily corrected with a good polish. Were the rollbars and M type seats an option on all models? Some of the drivers side seat pads i've seen look a little floppy, is this a problem? I'm being seduced by lower mileage as the best indicator of wear and tear but is there a limit where things start breaking? 40,000-50k seems achievable within my budget but a lot of good looking motors with 80 plus? 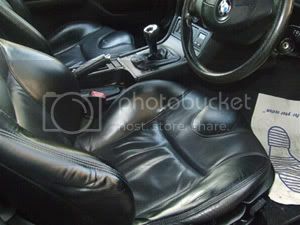 The drivers seat seat side "bolster" wear on almost all Z3's. Unless the leather is actually worn right through though they can be made to look remarkably better with some dye and a little TLC (search for my thread on Leather AND refurb in the knowledgebase. The seats you are referring to are the "sports" seats. They are very similar to the ///M seats but are a little wider and don't have the "ribbing" and use a different leather. I'm not sure if they were standard in the 2.8's, others will be able to advise. Rollbars were standard on all ///M's and I think from a certain date on 2.8's (I've seen early ones without). I bought a 1998 2.8 in february this year and love it. I like the styling of the sports seats in the 2.8's, really compliment the rest of the car. I get 37-38 mpg too and not expensive to insure, so well happy with the car. Last edited by seasurfer on Tue 11 May, 2010 16:37, edited 1 time in total. ive got the 1.9 and i wouldnt say its underpowered and its every bit as much fun as any other zed IMO. ok so it doesnt have the sound of the 2.8 but then again its lighter at the front and easier making progress through the twisties. other than rollhoops, i would try to get one with decent condition exhaust and brakes/wheels etc as those costs add up pretty quick. dont know if VANOS was on the 2.8's - if they are then that needs to be sound too as its a big bill to fix so i hear.. I've never owned a convertible nor any sort of sports car, unless you class a blue over silver 1.6L furry dice laden Dagenham Taxi XR3i. (It was cheap and in good nick so I had a good excuse). In contrast I actually enjoy driving my super torquey 2 litre tin can. a ten year old Berlingo Van so i'm easy enough to please. I'm not a speed freak so should I consider the 1.9 or will I be found wanting? Is the 2.2 good middle ground? The 2.2 is good middle ground, depends on your budget which engine you'll get. Why don't you drive a few and see what suits you, its part of the fun. The 2.2 is often quoted as being the best "compromise" Z3, sounds great as well but they often command a premium and a nice one would probably stretch your budget. def best idea to drive a few. i drove the 2.8 and whilst i liked it it did feel heavy both on the cornering and throttle. dont forget that for me i got the 1.9 as i had to start with zero no claims again as the zed is our toy so all my full NCD has stayed on the 320d estate. maybe in a years time i'll be looking to move up to the 2.2 - cant see myself having a Z4 yet as they are still what i consider silly money for something that wouldnt be driven that much. hope you find something you like and when you get it post some PICS !! I have a 2.2 which was my first Z3 and also a Z3M . My dad who was a car nutter had an XR3i at one point which he loved to bits. The 2.2 has better performance than the XR3i and looks great too. The 2.2 is plenty fast enough for most situations ............ I think the official 0-60 is about 7.9 secs. The Z3M is a gorgeous monster which gives 0-60 in under 5 secs ( most independent reviews rate it faster than the official BMW figure of 5.2 secs. Expect to pay 6-8k for a decent 2.2. M wise at the moment I would say 9k minimum for a good S50. Then the insurance and the maintenence on the M is a lot higher. big cheesy wrote: 'I nearly cacked my trolleys till I quickly tuned in'. Yorkshire Cruise 2008.
you have 2 zed's ????!!??!!! and a 2.2 and Z3M ????!!??!!! please tell me they arent the fast silver ones as well !!! One can never have too many zeds! 2.2 owner here & more than happy. My other car is a 4.4 V8 & that replaced an RX-8 230. I have driven both towards their limits when & where appropriate & safe. I don't rag my cars, (& always try to keep revs sensible until warm), but I enjoy progressive driving when the mood suits. IMO a little more thought required to briskly pilot a 2.2 in the dry than a 2.8 when aiming for twisty A or B road pace. For me the 2.2 seems well matched to the car - Just feels right. 2.8 may give the you a little more to think about in the wet albeit I have only driven a 2.8 in the dry so treat my comments accordingly. I sought a 6 cylinder car for the smoothness & only started looking at the 2.2 due to lack of decent 2.8's in budget. I hadn't totally ruled out prefacelift 1.9 & would have bought the right car for money if it was around at the time. 140HP engine on prefacelift is pretty reliable & can entertain. Same engine featured in the E36 318is & 318ti compact. Sought when new & still a following now. The Z3 2.2, (I have driven two), sits alongside an X5, (I drove a few), so sensible for me to avoid a second car with higher purchase & running costs. The Z3 is officially my wifes car & I suspect my fondness of the Z3M Roadster is greater than hers as she isn't hugely into cars. Despite my secret liking for the Z3M Roadster I have never been priveleged to own or drive one - perhaps I'll take a forecourted example out for a test drive sometime. Despite my, (untested), admiration of the Z3M Roadster I suspect the 2.2 is a slightly calmer car to live with day in & out than the Z3M....Perhaps others, (hopefully including whiteminks), will comment further on this as they are different cars in may repects. If not in a rush - Be honest with yourself re Budget to buy, sort any niggles, maintain & insure. Also be honest re your expected driving requirements. Then ideally go & drive a few decent ones with various engine sizes. Initial admiration may be based on larger engines but drive them a few miles & see what you think you'd want to live with daily. As with any car a slight engine issue can mispresent a car. On Z3's if tracking & bushes need attention you might not fall in love to start with. Oh I confess that I used to have an XR2, an XR2i & an 2.9 Sierra 4x4. There were a few good old Faster Fords. BMW or Ford - IMO the biggest driving factor = YOU ! Last edited by AW8 on Tue 11 May, 2010 22:15, edited 4 times in total. Black Z3 2.2 & Black X5 4.4 Sport. AW8 wrote: If not in a rush - Be honest with yourself re Budget to buy, sort any niggles, maintain & insure. Also be honest re your expected driving requirements. Then ideally go & drive a few decent ones with various engine sizes. this is sound advice IMO and very well put. They are rarer though - so 2.8 is probably your best bet! I loved the smooth effortless torque of my old 2.8. The exhilaration of effortless off the line good acceleration. So for me that'd be the smallest engine I'd go for & now 2.8's aren't even expensive to buy. But I'm sure the smaller engines ones are great fun too. Hi I have just been in a similar position to yourself as I only picked my car up yesterday. Have a thorough read of articles on the forum so that you are familiar with the car eg the boot weld saga. Make a wish list of refinements that you would like and order of importance. Decide if you are prepared to travel to look at a car and if so how far. Have a look at a few cars before you buy so that again you get a feel for whats good and whats bad. My own preference was I wanted a 6 cylinder so anything from a 2.0l up to a 3.0l the ///M was out of my budget entirely. I wanted auto roof, heated seats, roll bars, alloy wheels, leather sports seats colour of the car was not important as long as the body was in good condition. FSH was also important to me and relatively few owners. Mileage I was not too concerned about as long as the FSH was there but did come into play as I shortlisted cars. I have been to see about eight cars, some looked great in the advert but then the rear window was cracked £150+, one the passenger seat electrics were not working, had missing locking wheel nuts, kerbed wheels bits of toolkit missing and this was a 2.2 that they were asking best part of seven grand for. Another had dodgy paintwork the bonnet had been resprayed and bits of laquer were missing all over the body. The good thing about this though is that the good cars do stand out when you see one. In the end I had it narrowed down to two a pre facelift 2.8 and a post facelift 3.0. Both very nice cars but the 3.0 was two years younger and had 20k less miles and was £200 cheaper so not much contest in the end lol. Just my two cents hope it is of some use. I was very happy with my 2.8 pre face lift. never liked the rear wings and rear lights on the later ones. The lines on the body work just right on the 2.8. I had one for four years great fun. If you're not a speed freak - remember these cars are all about 10 yrs old. My 1.9 is reaching it's Bar Mitzvah (13) and seems to have had all the possible issues associated with Zeds. Thus, due to the great selection you have in the UK - my advice is to create a list of all the known problems (listed on one of the "buying" threads) and look for one in the best condition. ie low mileage, FSH, low no. of previous owners and garaged. Don't get me wrong - the car has become my hobby and in a weird way I appreciate the opportunity to fiddle with the car - but if you're not handy or don't have the time - the condition IMO outweighs all the rest. 2 water hoses & connector to rear of engine. ......it came with a new roof! 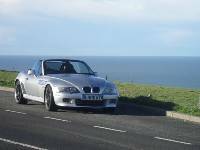 Don't get me wrong it is great fun, keeps me on my toes and gives great satisfaction....... Driving with the roof down is an added bonus. The 3 litre does indeed have alonger stroke - but it is 89.6 mm, an increase of 5.6 mm over the 84 mm of the 2.8 - not 2" (50 mm) which would have the pistons coming out of the block! The extra additional capacity and stroke will be responsible for - at a guess - a 5 to 7% increase in power and torque, the bulk being due to a different inlet cam, slightly larger inlet valves, and an exhaust system (also used on the 2.2) which seperates the front and rear groups of cylinders all the way to the rear (and only) silencer. Needless to say, the engine management map is different too. Yes - I would advise a 3 litre - funds permitting - due to the additional engine output, as in the future petrol will become increasingly diluted with ethanol, so reducing the power output of any engine. The more you have now, the more you will have left after the eco-warriors and politicians have had their way. The only things I don't like about the 3 litre are its use of a 'Drive by Wire' throttle, and the standard fitting of DSC - they are both unnecessary, and can give problems - particualrly the DSC lateral accelerometer. Last edited by Mike Fishwick on Thu 13 May, 2010 08:55, edited 1 time in total. so factor in any car is going to have issues due to the age - most of the above is cheap apart from rollhoops and wheels/tyres. get the best condition you can for the budget but if i were you i would be realistic about maybe including say £700 for incidentals on top of the purchase price - then you should be pretty well covered. 1998 Z3 1.9 in Arctic Silver..... maybe i should change my screen name to Chilly !! Nobody has mentioned the 2.0L and guess what has caught my eye? Looks to be a nice 2.8 on pistonheads in black for £3500. think its in the wrong section, under Z3M roadster. Warrior wrote: Nobody has mentioned the 2.0L and guess what has caught my eye? I've got a 2 litre! I find it more than powerful enough for me. the sound from the exhaust really surprised me. I didn't feel that I needed the grunt of the bigger engines. 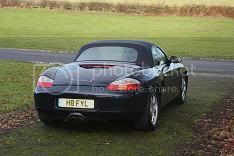 As a second car the key for me was the price, and I didn't want anything too high mileage or too old. Insurance is cheaper too - same issue of building a new NCD on a second car. The sound from the 2.0 is almost identical to that of the 2.2, and is also a very good option, but even rarer still! Still looking but the rain put a damper on my intended search this past weekend. Talking to a mate who knows a little bit about motors and he asked a pointed question as I reeled off the list of options and engine sizes.